Here's the makeup I wore for my date last week, as inspired by Lisa Eldridge's makeup for Glamour Magazine (December 2010). I hardly want to put these images side-by-side, the model looks so unutterably gorgeous. I had to tone down the eyeliner as I didn't want the guy sitting across from me at dinner thinking 'how much makeup is she wearing?!'. I'll definitely try it another time. I completely ran out of time to deal with my hair and had four seconds to take these photos. My Eyeko liner has died on me so I splashed out £2.50 on a Collection Extreme 24-Hour Felt Tip Liner. It's really easy to use and creates a perfect opaque black line. Having used felt-tip liners from Max Factor, Bourjois, 17, Eyeko and Collection 2000 I can tell you they're all pretty similar and all dry out just as quickly as one another. You can't go wrong with this one for under three quid; it didn't budge an inch. I somehow found the nerve to wear false lashes. That's how confident I am in my Duo Eyelash Adhesive! I used Girls with Attitude 'classic' lashes, which are quick to apply and provide fabulous yet subtle definition and length. I find that thick liner makes my lashes look short so falsies make a big difference. MAC lipstick in Vegas Volt on my lips, smudged in and topped with a pale pink Benefit lipgloss. 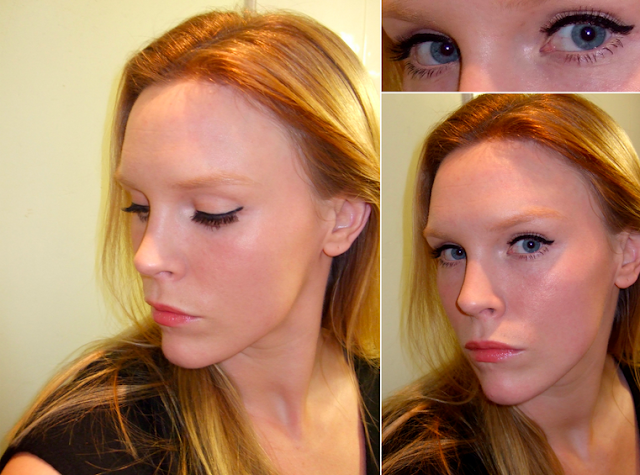 What's your favourite liquid liner? Do you prefer felt-tip or ink pot? @Lyuba-chan - Ooh I'd love to try the teal one although any kind of colour around my eyes tends to make me look like an 80's reject!